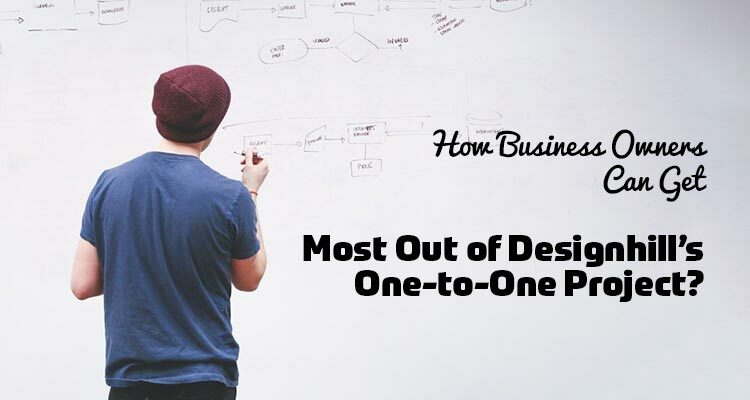 How Can Business Owners Get Most Out of Designhill’s One-to-One Projects? Graphic designs such as logo design, business cards and websites have always been the most important commodities for businesses across the globe. A fair share of companies spend thousands of dollars for the superior, unique and futuristic designs for their businesses. We are sure that you already have been told enough about the importance of graphical branding elements and how they can make or break the impression of your business. Superior and creative business designs are important to establish a strong brand identity, garner media mileage and build a loyal customer base. In fact, it wouldn’t be an exaggeration to say that great graphic designs lay the foundation of success for any business. But the difficulty with most new-age businesses, especially startups and small businesses, is that not only they don’t have the luxury of spending through the roof for graphic designs but also they lack proper resources. This is where custom design crowdsourcing marketplaces such as Designhill.com provide a great platform for business owners to launch graphic design contest and source as many as 100+ fresh and unique graphic designs for as little as $99. In a bid to make it possible for business owners to choose who they want to work with, Designhill recently introduced its One to One project. It is as a place where business owners can directly collaborate with designers of their choice, receive payments and exchange deliverables all in one convenient location. Having a one- on- one interaction with the designers will no doubt simplify the process of sourcing the exact design that you’re looking for. However, there are some things you need to take care of while working on one-to-one projects. Here are five pointers to help you before getting started with Designhill’s one-to-one project. This is the first and the most important step in zeroing on the type of designer you want to work with. It is a must to go through Designer Portfolios in order to check how they work and what their style is. Just by reviewing the design created by the designers, you will get a fair idea of how that particular designer works and if his style will suit yours. Choose the designers whose work appeal your senses and who you believe can create exactly what you’re looking for. You can always invite the designers you have worked with (outside of Designhill) to create a free portfolio at Designhill and participate in Designhill’s one-to-one projects. This will ensure iron-clad safety for your money and reduce all the hassles of those tiring back and forth of emails and report maintained to track the progress of the project. In addition, having a designer of your choice will save up a lot of time in sending emails or explaining in detail the type of design you are looking for. You can be carefree and concentrate on other aspects of your business. Describe clearly how you want the design so that designer to eliminate any chances of miscommunication. Tell him if you want a light or a dark background, how simple you want the design to be, where do you want the text to be (if at all you want text). It is a must to let your designers know about the business and the service you provide and your target audience so that the designer is able to create a unique and appealing design accordingly. This will reduce the number of revisions and feedbacks for you. After selecting a designer of your choice, who believe matches your style, it would be best to first negotiate the terms and the budget of the project. You can also compare the prices quoted by the designers in the marketplace with other designers. Your aim should be to get high-quality designs at affordable prices. Very clearly state the time by when you would need the final designs so that there is no confusion in future. Though it isn’t easy to provide feedback every day, it makes sense to provide feedback whenever required. Just pen down how and what you feel about the design created by the designer and what changes you would like in it. How would you like to see the next version of the design? Communicate your ideas and expectations to the designer clearly. Also, you can share the designs with your friends and take their views on it. Who know what you like, others (people in general) find complicated. We are sure that if you follow these five tips, you will be able to make most out of Designhill’s one-to-one projects. Within days, you would probably showing off a good graphic design such as a logo or a business card to your audience. It’s easy to get started with Designhill’s One-to-One Projects! All you need to do is to review Designhill’s especially curated ‘Design Gallery’ and send direct invite to the designer of your choice. Yeah! It’s as simple as that! To Learn more, Download Detailed Info-graphics on One-to-One Projects for Business Owners! So, what are you waiting for? Get started now and let your dream designs breathe to life! Previous Previous post: Here Is What You Get When You Go For Subscription Upgradation? Next Next post: Why Should You Upgrade Your Designer Membership Subscription?